We are proud to introduce The Maverick Poucher, capable of handling 12" wide x 18” long pouches and designed to process bulkier product. The product load is on a 30 degree incline. The average cycle time for this unit is six-seconds. The Maverick Poucher has a single bar seal, but if a higher production rate is required, a second bar seal can be attached to the system and the cycle rate will decrease to four-seconds. A Bar Code reader and verifier can be integrated into an automatic product feeding system, as well. The Control System of the Maverick Poucher includes Self-Diagnostics, Calibration Firmware and IQ, OQ Validation Protocols. Our systems provide continuous control of Intermittent Motion, of the pouch and product, throughout the cycle. The bag pick/open EOAT consist of an array of compliant vacuum cups. 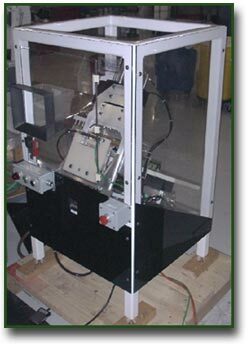 The z-axis motion is actuated by a dual position, linear thruster and is used to pick bags from the bag tray and open the bags in preparation for operator product loading. The product transfer platform consists of an array of vacuum cups mounted on a transfer shuttle. The platform assists with bag opening at the open station, transfers bagged product to the seal station and ejects the sealed product upon return to the open station. The Snorkel assembly contains evacuation snorkels mounted on a cam drive mechanism to qualify pouch corners and stretch the pouch flat. A preclosure closure will encapsulate the snorkels for evacuation and/or gas purge. A software timer allows consistent and accurate vacuum levels. The heat seal station incorporates a linear thruster driving opposing hot and cold seal bars. A PID temperature control system precisely regulates the heat bar’s temperature to maximized seal quality and aesthetics while reducing wear and maintenance of the heat bar. Upon completion of the seal cycle, the pouches will be released and transported via chute to the collection device of your choice. This cycle is repeated automatically. Quick pouch-size changeovers are accomplished by utilizing custom designed vacuum plates and cups. The cups are easily changed with predetermined, color coded barb locations on the vacuum plate to determine the various pouch sizes being used; and the changeover time is minimal with this standard feature. This plate design allows processing of a multitude of pouch/bag widths and lengths without changing the entire plate. The magazine can hold a 6-inch stack of pouches/bags. The pouch, magazine feed system side rails are adjustable to accommodate various pouch widths and lengths. The compact design of the ABS System allows ergonomic manual product filling, as well as integrated automatic product feeders. It incorporates "No Pouch - No Fill" sensing technologies to Communicate with integrated product dispensing systems, as well. The Maverick Poucher incorporates pick and place technology and state of the art, constant heat, bar sealing methodology. The ABS System picks the filled pouches from the transfer plate and places them into its jaws; providing Sigma 3 Seals. The system satisfies FDA Process Validation guidelines. The sealer utilizes a PID, digital temperature controller. A digital timer with 0.01-second increments controls the dwell. An air cylinder regulator controls the seal pressure with analog outputs for the constant monitoring of the Process with preset alarm values, to assist with your GMP. The ABS is mechanically attached to the Poucher and is controlled by a PLC. Standard features include built-in Calibration Firmware, Self-diagnostics and IQ, OQ validation protocols. Should any of the critical menu driven parameters (temp, press, dwell) exceed the preset limit checks, the Poucher will STOP processing and an Audio/Visual alarm will alert the operator. The pouches will remain in place until the problem has been corrected. After correction, the reset button is initiated and the cycle automatically continues. These functions are part of our TOTAL QUALITY CONTROL software-hardware package. This will assist in the validation of your process controls, to comply with your GMP. Following are options available for the Maverick Poucher. An Emboss Code System is custom designed to meet your requirements. Coding takes place during the bar seal process and embossing is located directly below the heat seal. Type characters are available at $13.60 each. Our Statistical Process of Equipment Control (SPEC) System provides data acquisition with direct printing and/or down load to your computer over an RS-232 interface. The operator easily keys the Lot #, Expiration Date, and Batch Count for Data Acquisition and History. The system operation for MAP and CAP Processing is as follows. A snorkel is automatically inserted into the filled pouch while a pre-closure system encapsulates the snorkel and the pouch. The gas flushing and/or vacuum processing occurs. The snorkel is retracted when the predetermined limit checks for processing are reached. The pouch is automatically sealed and/or coded. A snorkel style gas flushing and vacuum packaging system must be integrated into the ABS System at time of purchase. A digital timer with 0.01-second increments controls the process. Since 1981, About Packaging Robotics, Inc. has been committed to provide reliable yet affordable, robotic solutions to process premade pouches and bags for the medical, industrial and food industries. I look forward to assisting you in your automation cost Containment efforts, and await your reply.